WWF España have voted, by 226 votes to 13, to remove King Juan Carlos as honourary head of the organisation, after he was spotted a few months ago shooting elephants in Botswana. Juancar was appointed head of WWF España in 1968 only because the previous president, Félix Rodrgiuez de la Fuente, the Spanish “David Attenborough” died suddenly whilst on safari and they needed a high profile head to keep navigating the rocky waters of Spanish politics at the time. He accepted, but rarely seems to have done much for the organisation, at least in the last three decades. WWF España had suffered a huge internet campaign forcing the vote on its leadership, and reportedly had seen a wave of Spanish members handing in their membership cards in protest. I understand that the post occupied by Juancar will be eliminated. 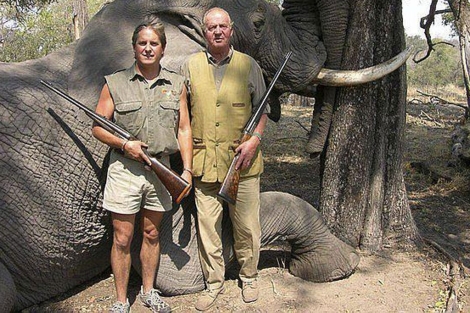 Juancar didn’t break any rules by shooting the elephant, culling of elephants in Botswana is permitted as there are so many of the blighters, but the outrage was mainly due to the King spending a wedge load of public money shooting elephants at a time Spain is falling apart. This entry was posted in Blog and tagged botswana, elephants, Juan Carlos, wwf by David. Bookmark the permalink.